This photo, taken by NASA's Cassini spacecraft on July 29, 2011, shows Saturn's A and F rings and five of its moons. From left, the moons are Janus, Pandora, Enceladus, Mimas and Rhea. A stunning new photo from NASA's Cassini spacecraft shows five moons of Saturn hovering around two of the gas giant planet's dazzling rings. The view looks toward the northern, sunlit side of the rings from just above the ringplane, researchers explained in a description. 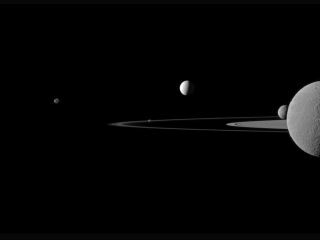 The five Saturn moons in Cassini's photo vary greatly in size, with Pandora (50 miles wide, or 81 kilometers) and Janus (111 miles, or 179 km) the smallest. The "Death Star moon" Mimas measures 246 miles (396 km) across and Enceladus is 313 miles (504 km) wide. Rhea is Saturn's second-largest moon, at 949 miles (1,528 km) across. In the image, Pandora appears near the center of the frame between Saturn's A ring and the thin F ring. The Cassini spacecraft was closest to Rhea when it snapped the photo — about 684,000 miles (1.1 million km), researchers said. The spacecraft was 1.1 million miles (1.8 million km) from Enceladus, a frozen world that spouts water-ice geysers into space. NASA launched Cassini toward Saturn in 1997, and the spacecraft arrived at the ringed planet in 2004. Cassini has been circling the planet to study its rings and moons ever since. Cassini also carried the European Huygens lander, which touched down on Titan in 2005. Cassini's mission was originally slated to end in 2008, but NASA has extended the Saturn flight twice, most recently until 2017. The Cassini mission is a cooperative effort by NASA, the European Space Agency and the Italian space agency.